The Mexico July 1st 2012 elections had a turnout of 63.1%, which is slightly more than 2006 (59%) and about the same as in 2000. After the first count Enrique Peña Nieto (PRI-party) had 18,727,398 votes (39.10%) and won the elections. Andrés Manuel López Obrador (PRD-party) had 3,192,281 (6.67%) votes less: 15,535,117 (32.43%). 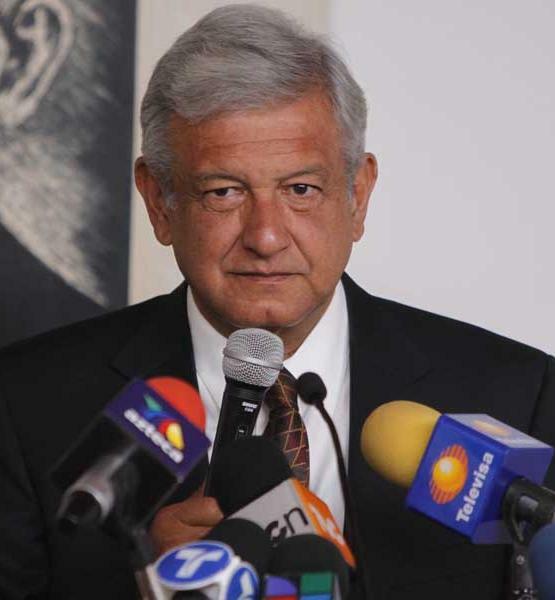 López Obrador did not recognize Peña Nieto's victory, claiming there had been widespread irregularities. López accused the PRI of spending more than their allotted electoral budget, biased media coverage (Televisa) and vote buying. So how serious are these allegations and what's López Obrador's chance in this rearguard action about the presidency? Peña Nieto denied the allegations and pictured López Obrador (a.k.a AMLO) as a "sore loser" with a history. After losing the 2006 presidential election by a narrow margin to Felipe Calderón. Then AMLO didn't recognize his defeat too and launched street protests that lasted for several months. This time AMLO demanded a total recount. The Instituto Federal Electoral (IFE) subsequently announced that there would be a partial recount, with presidential ballots from 78,012 of the 143,132 polling stations to be recounted, whilst ballots for the Congressional elections would be re-examined at two-thirds of polling stations. Automatic recounts were done in cases where irregularities were detected and where the margin of victory was smaller than the number of nullified votes. On July 8 after a partial recount of approximately 50% of the votes, IFE declared they had found anomalies but that Peña Nieto still had majority and was confirmed as the winner with now 38.2% of the popular vote and López Obrador 31.59%. Still a 6.61% difference. "AMLO: According to my calculations we win already"
PRD-party officials are now requesting that the IFE to review the PRI campaign’s finances to determine whether it exceeded its spending limits. IFE’s chairman Leonardo Valdés Zurita said that by not acknowledging the election results, AMLO was breaking the law as well as the civility pact he signed before the election. On July 12, AMLO presented his formal complaint to cancel the elections to the Tribunal Electoral del Poder Judicial de la Federación (TEPJF), on grounds of violation of constitutional article 41 which states that the elections must be free and authentic; with equal benefits for all competing parties. At a press conference at the Hilton Hotel, Mexico City, AMLO also claimed he had evidence. TEPJF Superior Judge Manuel Gonzalez Oropeza said in an interview that the evidence must be adduced by the appellant. While TEPJF is a body with investigative powers, it is also an instance that only rules from the allegations and evidence that the applicant would present. IFE officially has until 6 September to announce a winner. The winner will assume office on December 1st. Mexican election officials said it will take several months to investigate all the allegations. When you define "Vote Buying" as paying cash to voters in exchange for their vote/ballot, then this is almost impossible to realize or organize successfully on an influential scale, without being noticed. In Mexico, there is a general electoral census. Any citizen of age 18 or greater must go to an electoral office in order to be registered into the electoral census. Citizens receive a voting ID card (credencial de elector con fotografía), issued by the Federal Electoral Institute (IFE) that must be shown to vote in any election. The voting card also serves as a National identity document. When the voting ID card is showed at the polling station its ID is checked on the voters registration list. After the voter's thumb is checked for red ink, the voter receives 3 ballots (el presidente, senadores y diputados). Ballots and ballot stubs are equally numbered and difficult to counterfeit because of security features. Each of the ballots has to be cast by the voter in the privacy of a voting booth and then put into the sealed ballot boxes. After the voting, the voter's left thumb will be put into indelible red ink, the voter's voting ID card will get marked and the voter's name on the registration list will be ticked off with the word "voto". At each polling station at least one IFE observer is present and staff members resemble all parties. The total number of votes cast, plus the leftover blanks (including any voided ballots) should add up to the total blank ballots received before the vote, at each ballot box. Operations at the polling stations are witnessed by accredited electoral observers and international visitors as well as by the representatives of the political parties. "Voter Luring" is a better term for what happened during the Mexican elections and all parties , including PRD, were guilty of voter luring. It’s not against the law in Mexico for political parties to give out gifts — such as school supplies, a sack of cement, a hot lunch, or even prepaid gift cards. And all three major parties of the country do so, in National, state and municipal elections. Even in the most poignant cases involving a party exchanging money or goods for votes, it is very difficult to assure that the voter actually cast a vote for the party. Even if political operators force voters to prove their vote by taking a cellphone picture/video of the ballot casting — reportedly a common practice — voters still have the option of cancelling the vote after marking the ballot and taking the picture/video, besides cellphone pictures/videos could be easily exchanged between cellphones to mislead the vote buyers. Civic Alliance a Mexican watchdog group funded by the United Nations Development Program said in a preliminary report that their over 500 IFE accredited observers who were sent to observe 170 polling stations reported a dozen instances of children spying on voters. These “niños halcones,” or “kiddie hawks,” were allegedly sent to polling stations to guarantee that voters marked their ballots as they were paid to do. On the Friday before the vote, the PRD issued a statement accompanied by photos of 3,500 Soriana gift cards, saying they had been distributed by a PRI-affiliated union, and the leftist PRD party filed a complaint to the electoral authorities. Some of the people lined up at Soriana grocery to use gift cards, said they got them for supporting the PRI campaign. Other people said they were promised gift cards of 500 pesos after turning in a photocopy of their voter ID card, but received gift cards of 100 pesos. AMLO says that 5 million votes (not necessarily only PRD votes..) were stolen (presumably by the PRI..) and claims to have evidence. But AMLO didn't show convincing evidence yet. The right questions to ask are: 1. Would the vote buying have made a significant difference in the elections results and 2. Could the PRI and its sponsors have paid the bill? The answer on the first question is probably not. As Alberto Simpser, a politic scientist at the University of Chicago and author of a book about manipulations of elections, explains in an online article: "An survey in 2000-2001 in Argentina demonstrated that only 16% of surveyed citizens who received a bribe said that it influenced their vote. There exist additional factors that could impact effectiveness, such as embezzlement by brokers." Simpser also gives the answer on the second question. At a cost per vote of 700 pesos, an buying-effictiveness of 16% and 3,192,281 votes to be bought, it would cost the PRI roughly US$ 1 billion. So that is probably a "no", mainly because it is very difficult to conceal such large funds and sponsors. AMLO probably made this calculation as well and is now more focusing on PRI's exceeding campaign budget. MORENA’s on-line periodical, Regeneración, listed some 800 voting stations with more ballots cast than voters registered in that station. In one Veracruz location, Regeneración alleges that 300 percent of the registered voters cast ballots. The AMLO campaign is demanding that the Federal Election Commission investigate all voting locations with a participation rate higher than 80 percent. Other locations never opened. YoSoy132 said that other incidents of fraud happened as well including the theft of ballot boxes, shootings, and the kidnapping of election officials by police and security forces. There were reported cases of stolen ballots, which could be used for ballot box stuffing. Also several cases of counterfeit ballots showed up before the elections. Counterfeit ballots could also be used for ballot box stuffing, but not unnoticed. Ballots are printed and distributed with highly advanced security features and procedures. IFE keeps track of which ballot series go to which district, section and polling station. The unique ballot number and tight procedures regarding ballot distribution and tally sheet counts should discourage these fraudulent practices and should make them less attractive if not practically impossible. 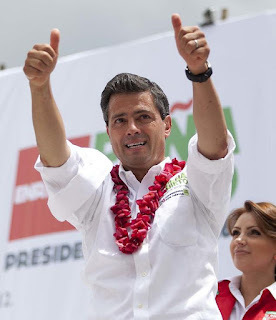 The Guardian newspaper discovered and published on June 7, 2012 that a secretive unit inside Mexico's predominant television network set up and funded a campaign for Enrique Peña Nieto. Wikileaks uncovered that the US Embassy in Mexico City in 2009 issued a series of cables indicating that Mexican political candidates, “are paying networks to provide them with television coverage” and that leading presidential contender Enrique Peña Nieto, in particular, “is paying media outlets under the table for favorable news coverage.” The issue was widely discussed in the Mexican media before the election day and probably had a negative effect on Peña Nieto's popularity. Although AMLO has stated that he will strictly work within the law, the leftist leader and his team of political operators have covertly encouraged the YoSoy132 student movement and other non-affiliated student groups to take more radical action on the street and raise controversy about the election results. Both activities mentioned above are in violation to Mexico's electoral laws. AMLO's complaint also pointed towards the PRI's campaign going over budget an alleged 1000% over the established allowed budget by the Federal Electoral Institute which is of 336 million Mexican pesos (US$ 24.2 million). Jaime Cardenas of the legal defense team of AMLO, said they have information that would prove the triangulation of resources between at least six companies and one individual to support the presidential campaign of Peña Nieto and the money would come from public budgets of state governments ruled for the PRI or even organized crime. PRI officials fired back on July 23, saying López Obrador's campaign spent 1.2 billion pesos ($88.65 million) more than was allowed in the presidential campaign. PRI Chairman Pedro Joaquin Coldwell told reporters at a news conference: "We have information that public funds were siphoned into the campaign of Andres Manuel López Obrador". Joaquin Coldwell suggested the funds were likely illegally channeled from the budget of cities and states run by the leftist parties backing Lopez Obrador's presidential bid. Elections observation is allowed for every organization that is accredited by IFE. IFE imposes no conditions or restrictions to election observers. Also Mexican citizens are allowed to participate as local observers throughout the electoral process as determined in each election by the general counsel of the IFE. Participants must request accreditation from the IFE, have no partisan affiliations and attend training. With more than 143,000 polling stations to observe there were approximately 32,000 accredited domestic observers; 696 international observers from 69 countries; 86 International visitors, including 58 electoral authorities; and 14 representatives of international organizations that focus on democracy. The large number of accredited International observers (who have no intention to publish their reports) is due to the fact that many countries in the world are very interested in how to organize fair elections in a country that's combating serious corruption and polarization. The European Union did send only two experts to Mexico for a "technical" observation of the carrying out of the campaigns and of the election day. They will not make any public statements about the election. OAS, the Organization of American States deployed about the largest International Observation Mission of 91 observers from 18 different countries of the Americas and Europe. The Misión de Observación Electoral de la Organización de los Estados Americanos (MOE/OEA) published by means of its chief César Gaviria Trujillo a preliminary statement and will publish their final report shortly. The Mexican Civic Alliance with over 500 observers published a preliminary report. Links to the final reports will be put here when available. The Mexico electoral system is held up by experts as top notch in the region. 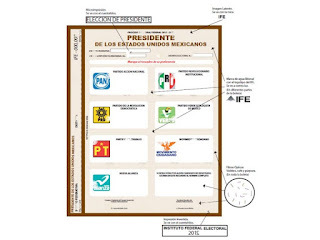 Mexico's Federal Electoral Institute (IFE) is a nonpartisan, professional institution in which political party representatives have access but no control. IFE manages a nation-wide system with uniform rules. Experts in the field regard Mexico's current electoral system even on eight points better than the US electoral system. President Ernesto Zedillo reinforced IFE's level of independence and autonomy in 1996 by completely dissociating the executive branch from any aspect regarding its membership or functions. The 2007 reform empowered TEPJF to prosecute not only political parties but also citizens, activists and candidates of political parties, as well as electronic media for electoral fraud. The new rules prevent individuals and third parties from purchasing television and radio ads for the purpose of influencing an election, placing restrictions on the content of political speech, and sharply reducing the amount of money available for campaigning. AMLO's filed complaint at TEPJF will be a test-case of the effectiveness of the Mexico electoral system. IFE did publish full data of the the recount on July 9. For each State, district, section and polling-station. The data is in a zipped vertical bar (|) separated values format, that can be easily imported in any spreadsheet to re-analyze. The file can be found here. Until now there are no inconsistencies in this data reported. 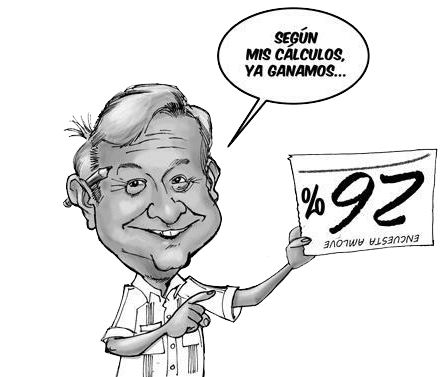 AMLO also experienced alleged fraud during the presidential race in 2006, when he lost to Calderón (PAN-party) by half a percentage point. A lot went wrong in the 2006 elections and it was a very close finish between AMLO and Calderón. Besides campaign frauds and other anomalies, there was convincing evidence of blank ballot fraud that AMLO could have won the presidential race. At each polling station, election workers were instructed to keep track of all blank ballots received, counting them before and after the voting. The add up's of the General elections 2006 were highly faulty (50%) and were recalculated by foreign observers. The calculated corrections made Calderón's advantage virtually disappear. Never the less Felipe Calderón became President. The Mexico 2006 electoral crisis resulted in a electoral reform in 2007, which had strong improvements but also weaknesses. 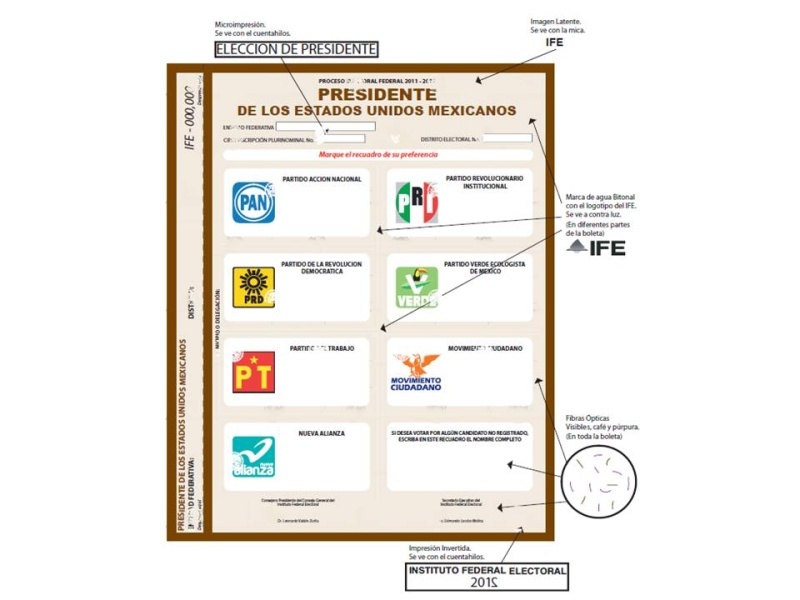 Personally I think the Mexican electoral system is still top notch and IFE has done a good job organizing the 2012 elections, taken into account all the circumstances. IFE was was unfairly blamed for fraudulent elections by PRD supporters. The problem that IFE faces is that Mexico society has become more corrupt and polarized over the last years. Corruption seems to have become a fact of life again in Mexico. If people are willing to accept and pay bribes for their votes and if local party kingpins still organize electoral fraud at the local polling stations or districts, there isn't much that IFE can do besides things that are already done: Education, impartiality, tight procedures, observation and openness. All cases of electoral fraud that are reported are for the prosecutor and TEPJF tribunal to judge, not IFE. An important factor is the position recently taken by the various civic organizations that acted as independent observers at voting stations throughout the country on election day. These organizations stated that although vote buying and voter coercion are still persistent, mostly in very in poor areas, they were not pervasive enough to justify nullifying the election. Also the formal complaint of AMLO at the TEPJF will most certainly only result in fines and not result in new elections. Simply because new elections with the same electoral system will probably result in the same (or more advanced) electoral fraud and irregularities. Faced with candidates who were in basic agreement on most things, from beefing up security forces to fight the drug war, to liberalizing labor market, to protecting corporate and media monopolies, many voters had nothing to go on except media presence and personal appeal. Whether AMLO or Peña Nieto becomes president, to get things done they both have to cooperate with corrupt officials, party king-pins and civil servants. PRI will not have absolute majorities in either the Chamber of Deputies or the Senate, which might induce it to negotiate. That is, PRI's Peña Nieto does not come with absolute power.